A suicide bomber killed at least 31 people and injured dozens in an attack on a polling station as Pakistanis voted on Wednesday. 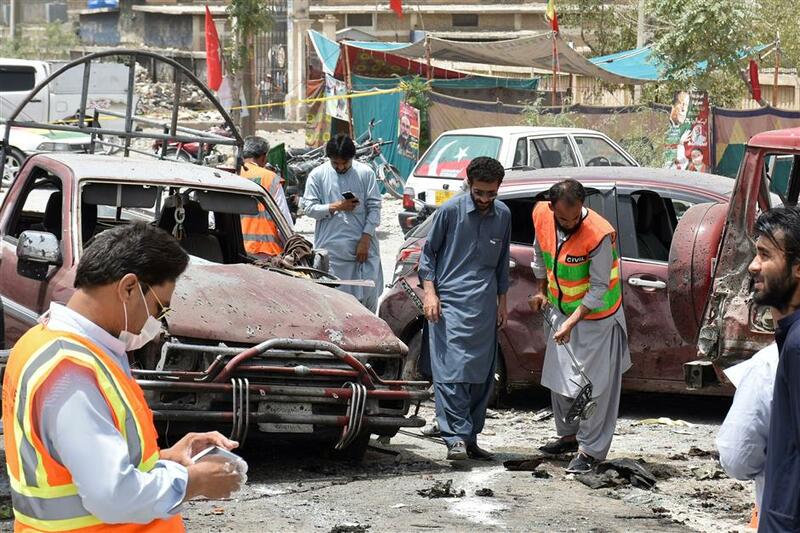 Members of the bomb disposal unit survey the site after a suicide blast, in Quetta, Pakistan July 25, 2018. A suicide bomber killed at least 31 people and injured dozens in an attack on a polling station as Pakistanis voted on Wednesday in a knife-edge general election pitting cricket hero Imran Khan against the party of jailed ex-Prime Minister Nawaz Sharif. The Islamic State militant group claimed responsibility for the attack in the western city of Quetta. Local officials said the bomber was trying to enter the polling station when police intervened and the attacker detonated his explosives. Neither Khan nor Sharif is likely to win a clear majority in the too-close-to-call election. “Imran Khan is the only hope to change the destiny of our country. We are here to support him in his fight against corruption,” said Tufail Aziz, 31, after casting his ballot in the northwestern city of Peshawar. Whichever party wins, it will face a mounting and urgent in-tray, from a brewing economic crisis to worsening relations with on-off ally the United States to deepening-water shortages. Khan has staunchly denied allegations by Sharif’s Pakistan Muslim League-Nawaz party that he is getting help from the military, which has ruled Pakistan for about half of its history and still sets key security and foreign policy in the nation. The army has also dismissed allegations of meddling. Khan’s Pakistan Tehreek-e-Insaf party has inched ahead of PML-N in recent polls, but even if it gets the most votes, it will likely struggle to win a majority in the National Assembly, raising the prospect of weeks of haggling to form a messy coalition government.